Operation Thank You is a 501(c)(3) non-profit organization that inspires America’s bravest by collecting and sending a variety of cards to current military service members, veterans, and wounded warriors. Help us thank our troops and honor our veterans with these treasured keepsakes by ordering cards today. Operation Thank You makes a great project for your workplace, school, church or civic club! If you have a question or comment, feel free to submit them using our Contact Form. We use 100% of donations to help send care packages to our troops. CLICK HERE TO DONATE NOW or CLICK HERE TO ORDER OUR CARDS! NEW Operation Thank You wallet-sized Thank You Card to honor American Heroes. These cards are meant to be given away to those who serve or have served in the U.S. Armed Forces or First Responder professions. They are great reminders to those who serve that we salute them for their service! Cards are the same size as a regular business card (2″ x 3.5″) and available in a pack of 100 for a donation of $5.00. 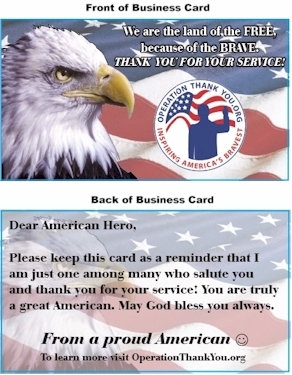 Order these cards to give away to the heroes in your community, workplace, place of worship, school, association, etc. Thank you in advance for doing your part to remind those who serve that we are grateful for their service and have not forgotten about them. Visit our Online Store to order cards for a donation of .20 cents per card. These cards are available in a packs of 25 or 100. PLEASE NOTE: For privacy and security reasons, we’re not authorized to give out any mailing addresses. We suggest that you contact a local military base to inquire about sending your signed cards to a unit that’s deployed or contact a local veterans service organization. If you cannot obtain a name and address of a military member or veteran to send your signed cards to, you can always mail them back to us and we will send them out on your behalf. 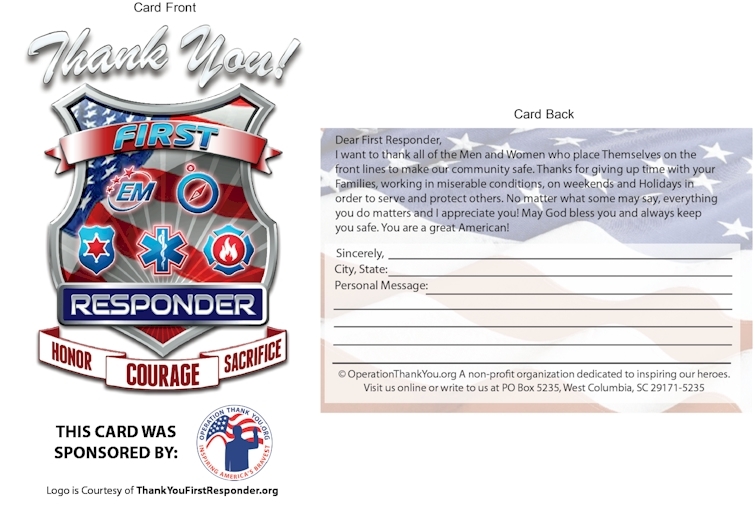 Operation Thank You is proud to release it’s 7th card to appreciate the First Responder community of heroes across America. Click on the image to order this new card today! If you have any questions, please use the Contact page to correspond with us.